I started investigating the issue. Started looking into the code. Started digging deep into the AndroidManifest.XML. To my surprise, no where it is mentioned as “debuggable : true“. It was a killing me, since I am getting late and the issue looks strange.Then I thought of to keep my nerves calm and started looking into the solution. After couple of here and there look up in Google I reached on the below solution. I have added the following line into the AndroidManifest.XML in the application tag. It warned me to avoid hard coding the debug mode. Believing on my guts, I ignored the warning and create a build for the client. I asked him to try with publishing. Wowww… It was a SUCCESS. I didn’t have time to celebrate my success on that day since it was late for home. I wrapped my stuffs and left. We need to specify the debuggable flag as false exclusively before publishing to the store. We have used Eclipse IDE to work this above mentioned project. 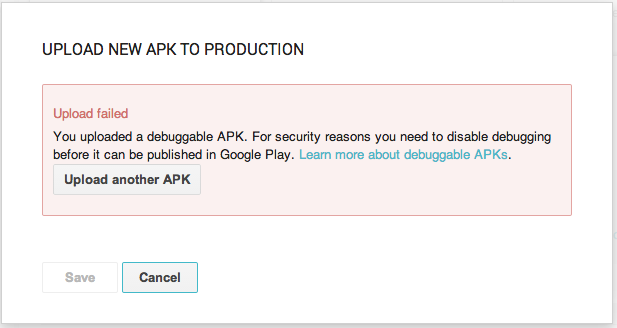 If we use Android Studio, this flag gets inserted automatically when we create a release build. This entry was posted in Android Development, Android Mobile, PhoneGap, x-platform mobile and tagged Android, Android Issues, Android Upload Issue, cross platform app development, Debuggable APK, Mindfire Solutions, Nirmal Hota, Phonegap, Software Developer, Software development, Upload Failed. Bookmark the permalink. Reblogged this on Nirmal Chandra Hota.